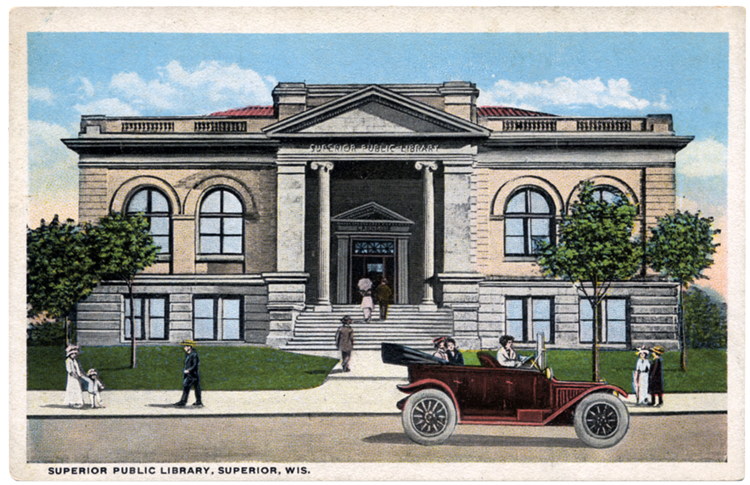 The Superior Public Library organized in 1888—a year before the city itself was incorporated—but little is written about the early history of the organization. Andrew Carnegie donated funds to have the library built in 1902. Carnegie emigrated from Scotland at thirteen, eventually organized Carnegie Steel Company, and was once considered the richest man in the world. He said that the rich have a moral obligation to give away their wealth, and he exercised that idea by helping fund over 2,500 free public libraries. The building closed as a library in 1991 when a new facility was opened on Tower Avenue. An investor planned to rehabilitate the building, but it took Superior officials a great deal of time to obtain clearance from the Hammond family—John Hammond had donated the property stating that the city could use it as long as it held the public library. By the time the property was cleared for sale, the building had been compromised by vandalism and neglect. Its windows remain boarded, and a recent city administration has investigated whether to have it, along with several other historic Superior buildings, destroyed.